Though 'one design build' is the goal. Destiny 2 is finally coming to PC tomorrow, and development partners Bungie and Vicarious Visions are keen to stay flexible in the face of the new audience. The teams have built tools that will allow them to tune PC and console builds differently should the need arise. "Our goal is to keep everything the same across all our platforms. 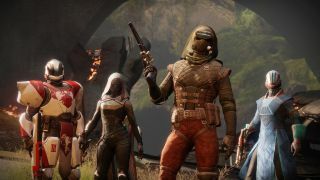 We did do some work to allow us to tune things for PC, just because we wanted to be ready if we needed to do something drastic," Vicarious Visions engineering lead Thomas Gawrys told PC Gamer at a preview event at Bungie HQ last week. We don't want to get stuck in the lurch like 'oh god I wish we could tune this one rocket launcher separately'. "That whole 'one design build' that I mentioned this morning is really the goal," added Bungie PC project lead David Shaw. "That work we did, we don't want to get stuck in the lurch like 'oh god I wish we could tune this one rocket launcher separately', we built stuff that will allow us to diverge if we need to, our intent is to stay as similar as possible, but we'll see what happens." It will be fascinating to see how a move to mouse and keyboard might disrupt Destiny 2's gun meta. Will hand cannons be more viable? Without the sticky auto-aim on a control pad, will autorifles fall out of favour among PC players? "Yeah, it's a tough question to answer," said Gawrys. "One thing I think about, this is just my opinion, I think it's going to be different because people are going to think about it differently, not because we've designed it to be different, not because we want it to be different. People are going to play things differently, people are going to have a different experience with input, and people are going to have different opinions." If all goes to plan the PC will receive the same balance updates as the consoles, and at the same time too. Bungie also confirmed that patches, updates and DLC releases will be "day and date with PC."